California is known for it’s warm, inviting weather and plentiful sunshine. Bottom line? There is no shortage of opportunities for an outdoor adventure with your pooch. Whether you leash up for a walk, hit the beach, or visit the local dog park, to keep that tail wagging, make sure you keep these safety tips in mind. It’s hot out, as it is everyday, so how can you enjoy time outdoors without running the risk of your pooch overheating? Schedule your walks and doggy adventures in the morning or evening hours when the sun isn’t at its hottest, and bring along plenty of cool water for the both of you. Stick to grassy and shady areas, as bare paws on hot pavement is just as painful to them as it is to you. Keep a towel in your car or backpack that can be soaked in water should your pooch start showing signs of heat exhaustion, and have your local vet on speed dial. Don’t forget to schedule your pooch for a trim so that Fido isn’t getting too hot, but avoid shaving so that sensitive doggy skin has a layer of protection from the sun’s burning rays. Now that you are armed with the necessary information to keep your pooch safe in the California heat, the logical next step is to head outdoors right? Not so fast. Before you leash up, make sure you brush up on your dog’s public etiquette so that it is an enjoyable experience for everyone. This is especially important if you will be heading to an off leash dog park or beach, as it not only keeps your dog safe, but fellow canines and humans too. 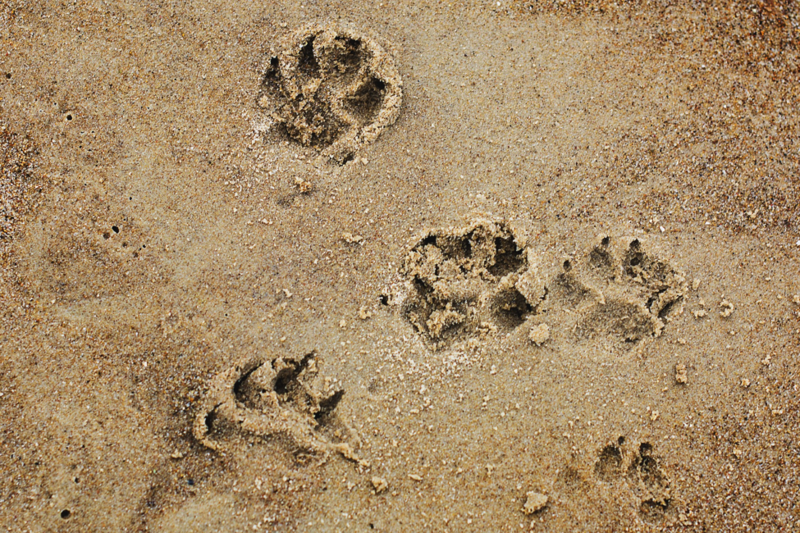 While the dog park is similar to your backyard, the beach offers its own set of safety hazards. For starters, both you and your pooch need to lather up with sunscreen, especially if your four-legged companion is short-haired, light-colored, or hairless. Doggy noses are prone to burning too. While the ocean water will certainly keep Fido cool, drinking it will upset his tummy, so bring plenty of fresh water. Keep an eye on your pooch at all times when he is in the water, and be wary of rip tides and deep spots. At the end of your beach day romp, be sure to rinse your pooch off with clean, fresh water to prevent sand and salt from irritating his skins and paws. Whether life has you busy or you don’t feel like venturing out into the heat, having a dog walker in your pack ensures that your pooch still gets plenty of exercise and outdoor exploration. According to Leila Offner, owner of Precious Petcare, the best part of her job is “Helping pet parents who are in need of taking care of their fur babies when they are away and adopting us into their family.” Offner prides herself on gaining client’s trust and ensuring their doggy companion is happy and safe. Whether you have her take Fido on a walk or utilize her doggy day care, you can be sure that Fido will have fun in the sun. Your pooch needs exercise that only a trip outside can bring, so make sure you take the proper safety precautions. By being prepared for any situation, you can enjoy countless doggy adventures together. Plus, with a trusty dog walker in your pack, you’ll rest easy knowing that Fido is always in good hands.